Weekends at our house are NOT relaxing! Usually Mr. Oopsey Daisy is only in town on the weekends, so we are crazy busy running errands, organizing, and just trying to get our "family stuff" done. We kept our book advent going, but we did activities instead of crafts. 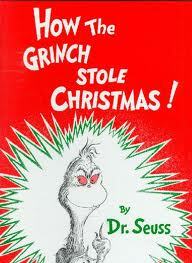 Day 4 - How The Grinch Stole Christmas. Another genuine classic! I love all things Dr. Seuss, so I snuck this book into our advent even though I didn't think Little Man would make it through the whole story. Boy, was I wrong!! He sat through the whole book and just soaked it up. He loved it! For our activity, we watched the movie of How The Grinch Stole Christmas and had a pajama party! While we watched the movie, Little Man's Daddy was putting together a sage bench for me. (I am having way too much fun shopping online, although I think the hubs is getting sick of assembling all of my new furniture!) Little Man sat in the drawers, called it a "choo-choo-train" and had a great seat for the movie! Day 5 - How Santa Got His Job. 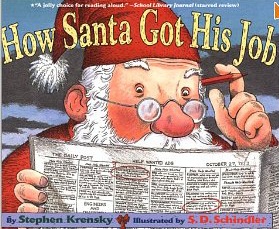 This is a darling book describing Santa's previous job experiences. Very, very clever. 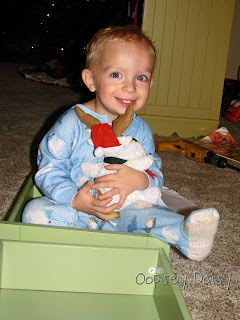 For our project, Little Man wrote his first letter to Santa! Very exciting. Granted I actually did the writing, but Little Man did hold the pen with me while I wrote! That explains the messy writing--it's very difficult to write with a toddler's hand in the way! But he liked helping. We talked a lot about the gifts he hoped for (gifts that Santa may or may not have already prepared!). Isn't the Santa stationary adorable?! You can download your own stationary at Stay and Play where Holly generously offered her printable! We'll be back with more crafts tomorrow. 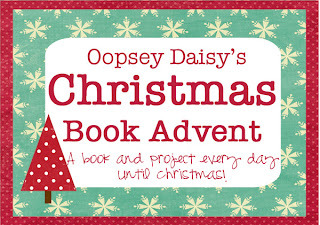 Are you enjoying your own book advent this year? You're little man is too cute. Love the little letter to Santa too. Great ideas! This is a collective post for all of your ideas, I am a little behind this year in my Christmas planning (mainly advent activities) so I am trying to catch up this week…better late then never, right 🙂 haha. Just wanted to say thanks for all your ideas. I love them and will be using them! I am so glad I found your site!!!! 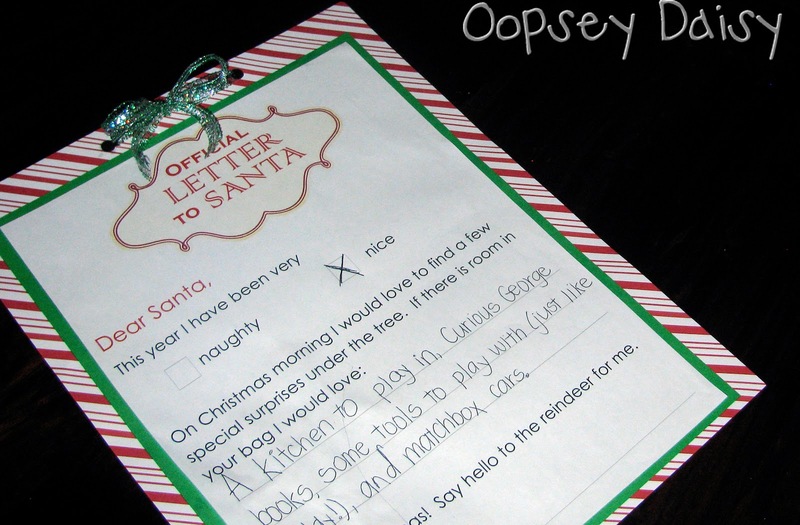 Glad you could use the Santa Letter Printable…though you made it even cuter! I always love the photos of your happy Little Man…he's a keeper! Stumbled across your blog today. 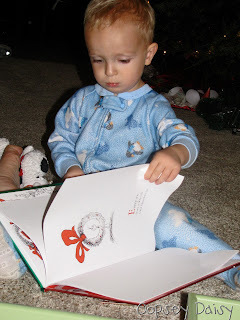 Love all the Christmas book/craft posts!